Looking for St Petersburg cocktail bars? If so, don't look further! Here's a list of the coolest bars in the city to hang out. For a good time with friends, a birthday, or just because you want to relax, why not spend your evening in one of the best city's cocktail bars, and discover a flowering local bar scene that doesn’t just revolve around ice cold vodka shots. Fun night at the Daiquiri bar in St Petersburg, Russia. From Daiquiri, a casual bar with friendly girls in racy outfits and handsome men in suits serving more than 100 delicious cocktails to Tsvetochki, a laidback cafe bar where you can drink anything from pots of tea to cocktails, or Bar 812, which changes from a quiet drinking place on a weeknight to a busy dancing place at the weekend, St Petersburg really has something for everyone. Below a list of well known cocktail bars worth visiting for an awesome night out with friends or even on your own. "A Place for Cocktail Connoisseurs!" Apotheke Bar is considered one of the best St Petersburg cocktail bars. Situated in a quiet oasis where you can partake of delicious hand-crafted cocktails, it’s open from 8pm to 3am (5am on Fridays and Saturdays). Their motto is “Think what you drink” and you just need to tell the bartenders what you’re in the mood for, and they’ll concoct a cocktail to suit. To find Apotheke Bar is a bit difficult, look for a glowing red cross in the window and to get inside just ring the bell. The setting is relaxing and intimate and creates the ambience for conversation and thoughtful drinking. If you go, try Bloody Mary! Khroniki Bar is a bar, a diner, and a pub - open from 6pm to 2am, and on Fridays and Saturdays till 5am. Stylishly designed it presents a very modern yet cosy interior complete with gilded antique Soviet chandeliers. If you fancy good Nordic cocktails chased by sprat sandwiches this is the Club for you. Vodka abounds, be it Russian, Finnish, Swedish or Danish. You must try the special cocktail “Free Ingria” - it’s highly recommended. This is the perfect bar for a night of conversation among friends, so don't miss it. The friendly and hugely experienced bar staff at the Daiquiri Bar will make you feel most welcome here. Relax in the comfortable red leather sofas or perch on the bar stools to experience some amazing cocktails – over 300 to choose from! 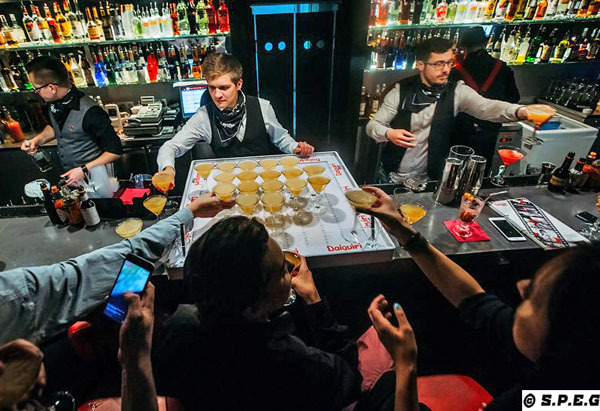 These guys were the winners of the World Cocktail Competition so trying some is a memorable experience – try a flambé cocktail giving a spectacular show as well. "Great Place with Awesome Crafted Cocktails "
Orthodox Bar, open from 6pm to 2am, has a bar card dedicated to iconic Russian artists, poets, writers and composers. Try a Tchaikovsky “Nutcracker” or “Sleeping Beauty”, or perhaps a Checkhov “Chestnut” or a Dostoevsky 3-shot “Brothers Karamazov”. In addition, they have other liquors both domestic and international. If you’re looking for a really interesting place with rave cocktails and vodkas then visit this top St Petersburg cocktail bar. The food isn’t bad either, and with such an array of cocktails to choose from you’ll need food too! Tipplers has a reputation for delicious cocktails and shots in a charming atmosphere. The bar which is a bit off the tourist track is open from 6pm to 5am and boasts a blended English and American classic bar culture. They even serve non-alcoholic cocktails which is great if you’re pregnant, or the designated driver. The bar staff are friendly and most helpful explaining their concoctions which are beautiful and Instagrammable. After those cocktails order some of their delicious food. One of the best St Petersburg cocktail bars! "Trendy Bar to Start the Evening"
Tsvetochki Bar boasts a menu of 70 different drinks so there’s something just for you! Open from 3pm until 2am (or 5am on Fridays and Saturdays), this is a café-bar where you can sit around wooden tables and drink tea or ingenious cocktails. Drinks are conveniently priced as shots for 200 roubles, tini-cocktails for 300 roubles, or long drinks for 350 roubles. Eclectic variety of music styles complete the trendy theme. If you go, try Dovlatov and Whisky cream.